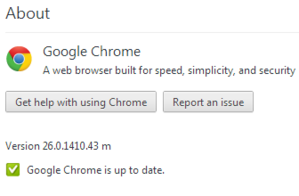 Four weeks after the launch of Google's Chrome 26browser into beta, the final version debuted on Tuesday. The most notable enhancements in Chrome 26 include a new spell-checking engine, as we saw when the beta version arrived, but also included are several other new features and a few key security fixes. The software, version 26.0.1410.43 for Windows, Mac and Linux, is being delivered as an automatic update to those already using Chrome, but it's also available as a free download. Here's a rundown of what you'll find. First off, the Chrome team has refreshed the dictionaries for all languages as well as adding support for several new ones, including Korean, Tamil, and Albanian. “In addition, users who add custom words to the dictionary can now sync their settings to bring those changes to all the devices where they use Chrome,” explained Google software engineer Rachel Petterson in a separate post on the Google Chrome Blog. The “Ask Google for suggestions” feature is now available to Windows, Linux, and Chrome OS users. Meanwhile, the spell-checking feature known as "Ask Google for suggestions," which is powered by the same technologies used by Google search, now includes support for grammar checking, proper nouns, homonyms, and context-sensitive spell-checking in English. Currently, the new spell-checking features are available only to users on Windows, Linux, and Chrome OS. Mac support is still in the works. Windows users can now take advantage of a new ability to create desktop shortcuts for multiple user profiles. This allows users on a shared PC to sign in and access their own, personalized copies of the Chrome browser complete with their own bookmarks, themes, and settings. On the Mac and Linux side, meanwhile, Chrome 26 now features an asynchronous DNS resolver, meaning faster performance when downloading Web pages linked to multiple domains. Last but not least, an assortment of bugs were fixed in this new release, including two high-severity flaws. There was one in Web Audio (netting a $1000 bounty for the person who discovered it) and one labeled, “Ensure isolated Web sites run in their own processes.” Also patched were four medium and five low-severity vulnerabilities.